AD FastReporter is a great way to make generating, storing, scheduling and sharing AD reports easier and faster. It’s straightforward to use so you don't need to be a scripting or LDAP expert. With our free version, you can use a range of built-in forms to generate reports, while our Pro version provides additional tools to help you create your own customized report forms. 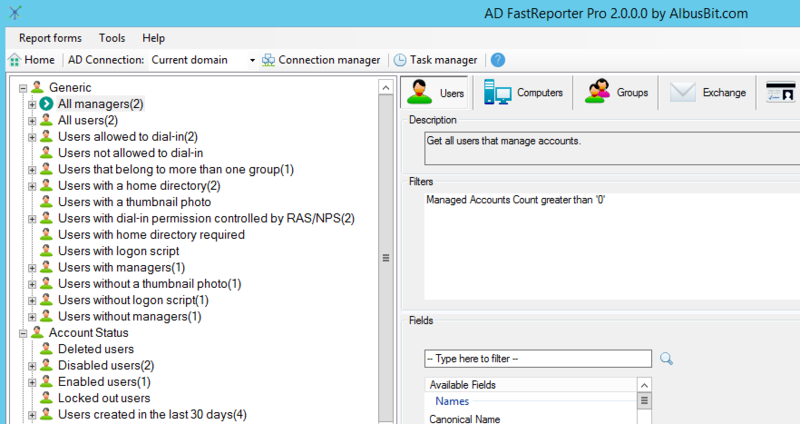 AD FastReporter is an Active Directory reporting tool that saves valuable time for you and your business – no knowledge of scripting or LDAP is required. 2. Browse through the built-in report forms to find the one most suitable and then customize it if necessary. 3. Press ‘Generate’ and sit back while the AD FastReporter creates the report. AD FastReporter sets you up easily and quickly. Our user interface is designed for all levels of knowledge. AD FastReporter is one of the fastest reporting tools available and enables you to generate complex reports quickly and accurately. Choose from more than 200 groups, exchange users, contacts, printers, group policy objects and organizational unit reports which are available. View the full report list. AD FastReporter gets you up and running with a built-in local database and database engine so there’s nothing to install or configure. 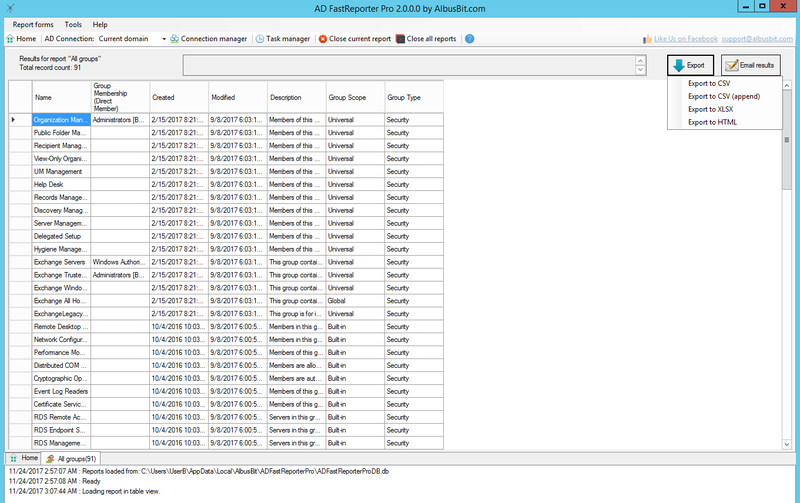 AD FastReporter automatically saves all your custom report forms and generated reports to the secure database, but, if you prefer, you can easily turn off this function. 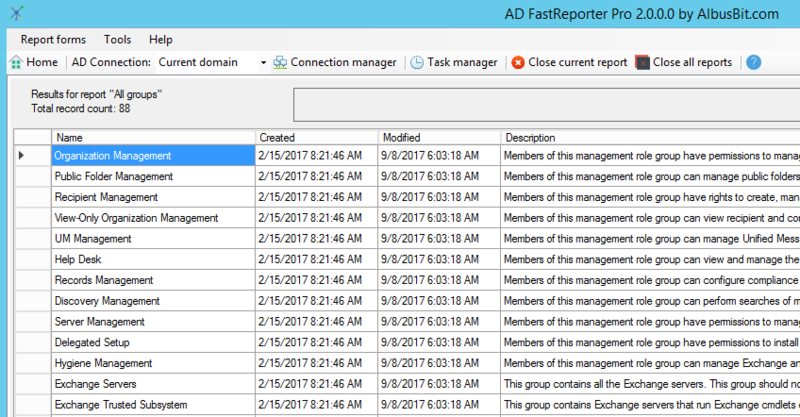 AD FastReporter helps you create various tasks that you can automate with Windows Task Scheduler or any other scheduling tool. Each task includes connection, report form, export options and email options. Every time you create a task you will receive a task ID which enables you to perform the task via the Windows command line. You can run AD FastReporter on any modern Windows operating system and on older versions starting from Windows XP SP3 and Windows Server 2003. To make life easy, we have both 32-bit and 64-bit versions integrated into one setup file. You can export reports from AD FastReporter to three formats to suit your requirements – CSV, Excel (XLSX) and HTML. AD FastReporter includes the standard LDAP attributes you may have seen in other reporting tools – and lots more besides! It offers you a range of calculated attributes that you won’t find in any other tool or in PowerShell commands. View full included field list. 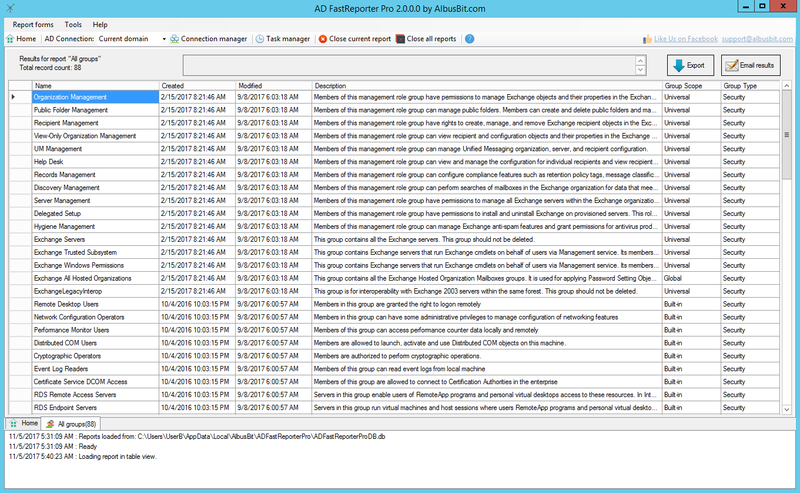 AD FastReporter is one of the fastest reporting tools on the market, especially if you’re dealing with a large Active Directory object count. We boost speed and efficiency by reducing the number of LDAP requests we send to your domain controllers. It’s easy to make changes to AD FastReporter’s built-in report forms or create a bespoke report from scratch. Our intelligent filter manager saves you valuable time by making it quick and straightforward to create custom report forms. To improve the efficiency of your communications, you can send reports directly from AD FastReporter as email messages or attachments (CSV, Excel (XLSX) and HTML). To ensure accuracy, all our field values are processed by information from official Microsoft resources. 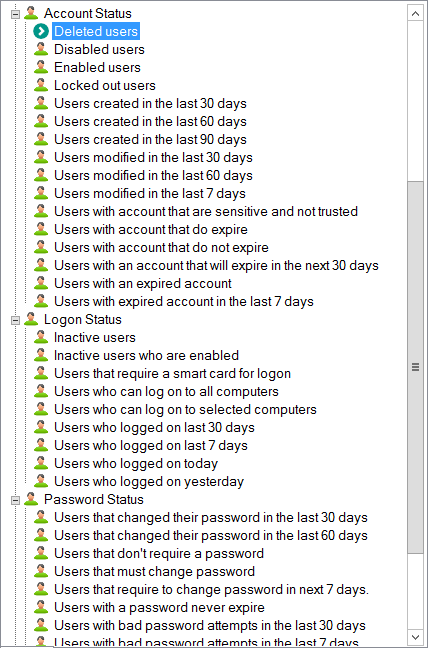 AD FastReporter can handle various field types ranging from inherited memberships to non-replicated attributes like last logon and bad password time. Choose from over 200 built-in report forms. See all built-in report forms. All report fields have a description and LDAP attribute name so it’s easy to find fields and understand what each one will show you. All field values are converted to an easily readable format so they are easy to understand and you don’t have to use other tools to convert the values. You can select and add any field from the available fields list to your custom or built-in report form. See all available fields. 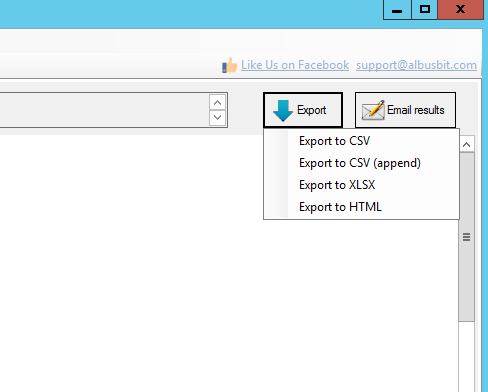 You can export reports to CSV, Excel (XLSX) and HTML formats. You can also send reports directly from AD FastReporter as an email message or attachment (CSV, XLSX and HTML). 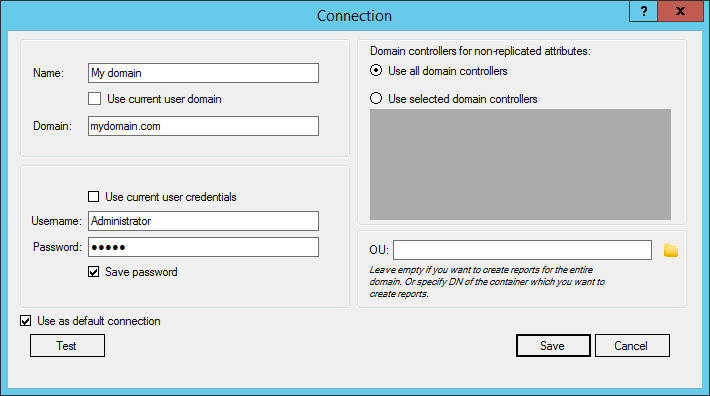 You can have multiple Active Directory connections to any domain your workstation can reach, as well as custom credentials and an OU/container filter. Reports are saved in the archive - a secure, local database - so that you can view export reports that you have created previously. 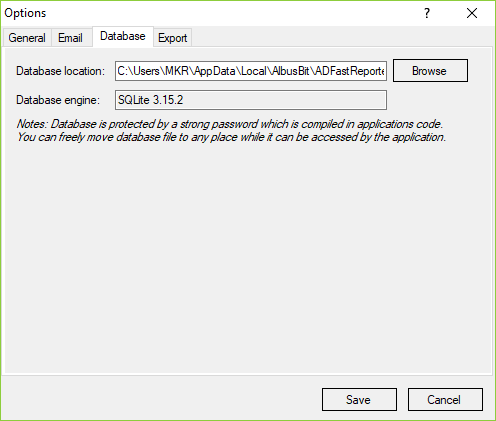 AD FastReporter uses SQLite as an embedded SQL database engine. SQLite does not need a server or separate process - it only needs the .DLL files and database file that are included in the setup file. More information. 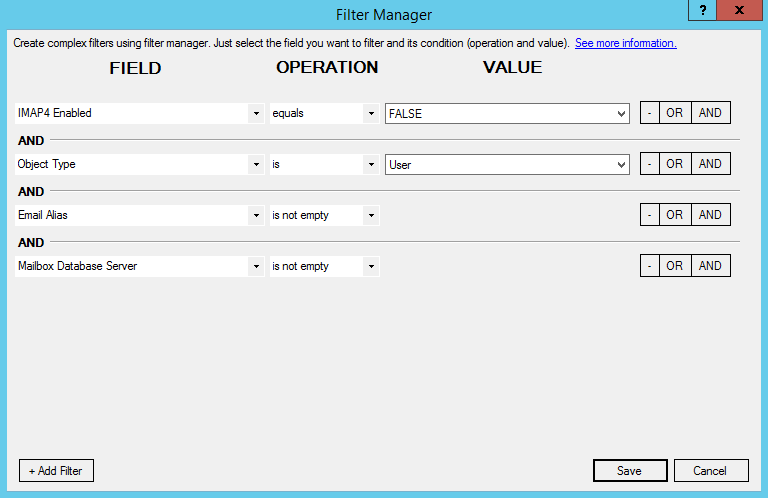 Our filter manager is intuitive and easy to use - just select the field you want to filter. It will display all the available operations, and you simply enter your filter value. This feature enables you to execute a task via the command line and schedule it from your favorite task scheduling tool to automate the report generation and distribution process. AD FastReporter provides eight report categories. Each report category has its own report forms and set of available fields. Check the table below to see, what LDAP filters are used for each category. I downloaded this and ran a few reports. It's very fast and lightweight. Most of the reports are something that I could do myself by building my own export scripts, but each report would take some time to develop on my own. I have tested your tool and have found it to be quite useful for the general type of reports one may need to run . The mix of built in reports is quite comprehensive.I like that you have added export to Excel which is missing from other AD reporting tools I have tried. 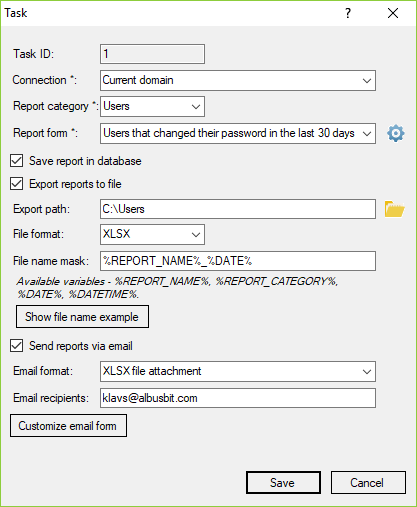 Albus Bit AD FastReporter is a lightweight, affordable desktop application that lets you generate premade or custom Active Directory (AD) reports and export them to a variety of different formats. Well done, great addition to my tool belt. I've been using AD FastReporter Pro for about 6 months. I happened into it in my search for continued support with ADinfo by CJWdev, who vanished into thin air somewhere. Due to his disappearance I was stuck without a tool and an impending regulatory audit and AD FastReporter came to the rescue. I use this for auditing purposes both for internal audits as well as regulatory audits. It has so far been great for this. It allows the creation of custom reports and even allows for saving of older reports for reference if you need to try and track a change or compare current information to older information. Every report is easy to customize to help get the info you need. There are plenty of pre-built reports as well that should fit most any need out of the box. Reports are exportable to csv, xlsx, and html as well as the ability to queue up an email right from within the application. My only complaint and it's personal preference possibly... I don't care for the tabbed viewing of reports. It's not super clear to me that a report is opened in a tab and I find myself very consistently closing out of the entire application to exit out of a single report. I would like to see the tabbed interface more clearly indicate that you are in a tabbed interface and which tab you are on. It's there, but it's very strangely implemented. The tab's are at the bottom and the button to close the report is in the center top of the screen. I think the tabs should be at the top and contrasted with the rest of the application and individually closed with an x on each tab (think web browser).